We present here an autonomous agent-based system tightly coupled with Geographic Information Systems (GIS). Our objective is to model a city’s dynamic in order to foresee both its urban evolution and the influence that the appearance of new settlements has on the overall electricity demand. This environment is deployed on a GIS-based Multi-Agent System platform where the geographical and communication components have been abstracted from the agent system onto the environment. 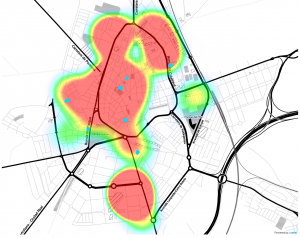 The configuration model uses geographical information in order to improve the agents’ connection and perception of their surroundings. Based on the agent’s choices, we forecast urban evolution and derive the expected increment in electric consumption. We have validated our approach with real data and discuss here our conclusions.